It’s tempting to think of Google keywords like candy: the more SEO keywords you put your content, the more clicks you could get. But keywords don’t always work like that. You can heap sweet piles of keywords into your content for traffic’s sake, but it’s hard to get the hoped-for results. It’s true that strategic use of search terms is likely to get you some new keyword rankings and visitors. So it’s important to know which keywords to use. And then, keywords can really help you if you’re ready to guide your new traffic to serve your goals. Which keywords are best to bring in the right people? The law of attraction for web traffic starts with knowing what search terms your target customer is typing into a search engine. Start with your customer’s mindset. What two or three words do they use to get started seeking help? Finding Google’s list of words and phrases customers use shows you the important words to position well in your content. You need to know which terms people are using, and what keywords Google uses for these ideas. 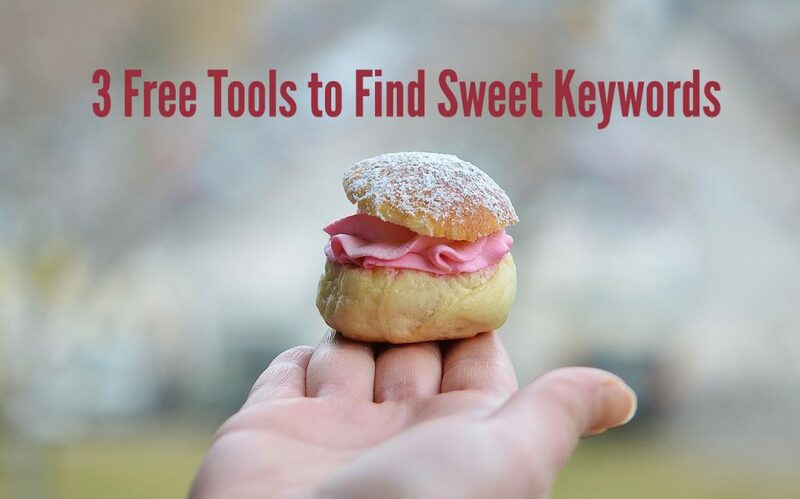 There are a couple of great free keyword tools to help you find search terms and their search volume. We’ll look at three helpful ones: the Google Keyword Planner, Google Trends and the free Keyword Research Database by SERPs. 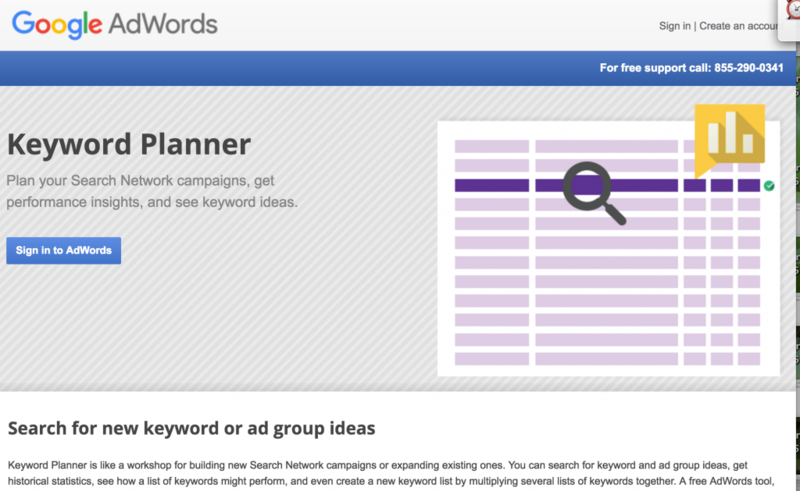 The Google Research Planner is made for people to choose search terms for Adwords paid advertising. But it’s also a great free tool to find keywords to use, and estimate keyword traffic for your next piece of traffic-building content. But don’t worry – you don’t have to buy ads or spend money to use it. It will show us actual search terms that people are using, and we don’t need to spend a dime. To use it, you will need to have a Gmail account or a Google account, and you will need to sign in to Google. 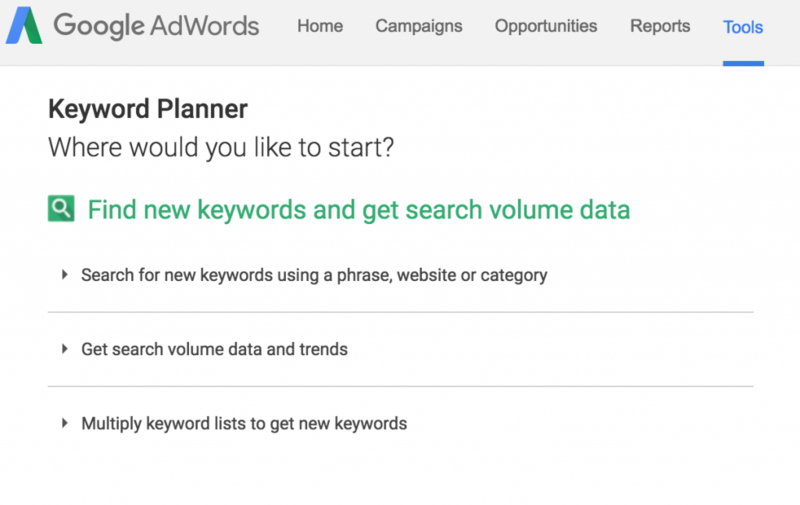 Click on the “Sign in to Adwords” to get started. Let’s select “English” for the language used by people searching, and “United States” to explore this region. 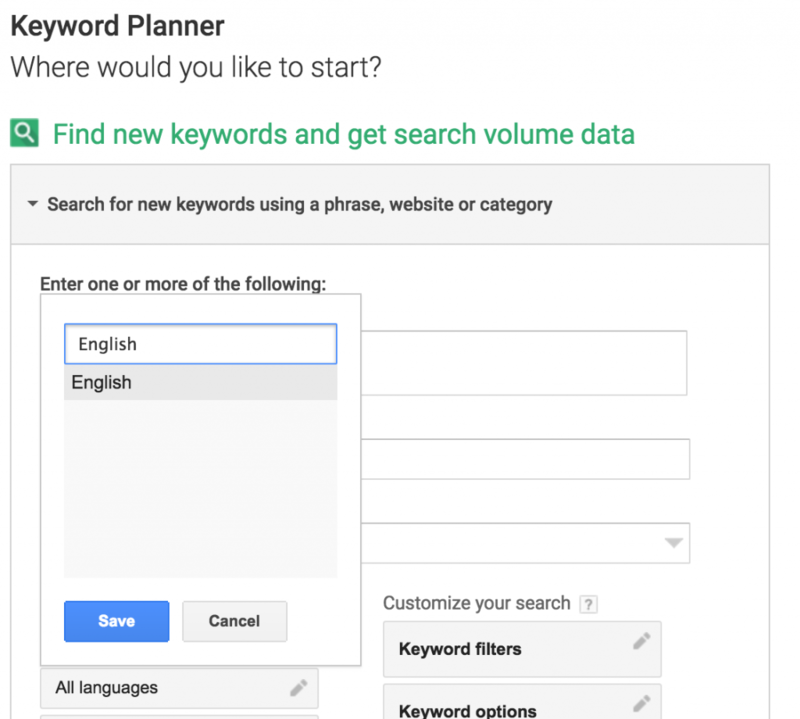 Then type in a keyword phrase in the box labeled “Your product or service.” To see the tool in action let’s optimize this post for people who want to learn to use keywords effectively. We will look for terms about using keywords. Let’s look at what we get for one possible term: “using keywords.” Here is an example of a search form filled out. 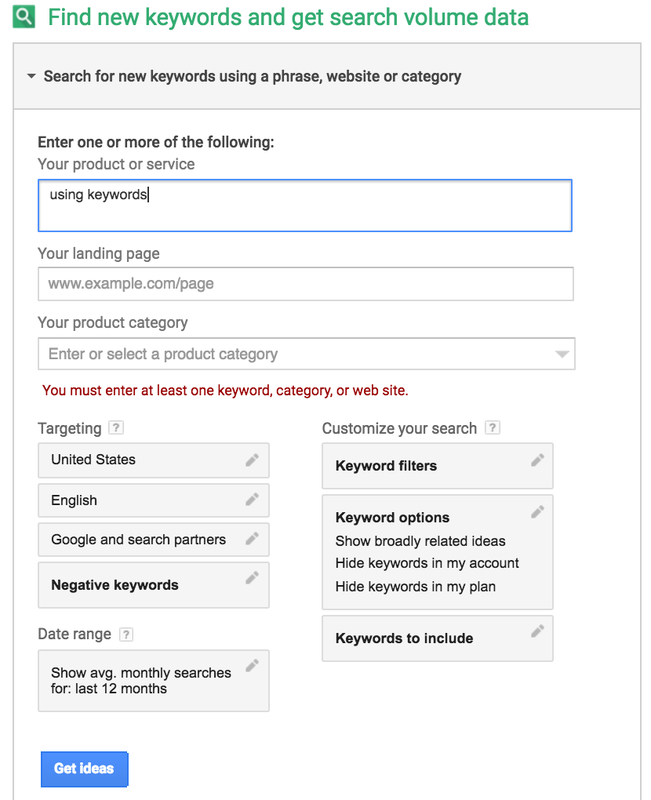 For our purposes we ignore suggested bid or competition — these are for Adwords users. We’re just looking for the search volume around 1,000-10,000 US searches per month. YouTube marketing expert James Wedmore suggests finding a term that has a global monthly volume of 12,000 or more monthly searches. In a Warrior Forum discussion for marketers, one member suggested 3,000-50,000 monthly searches is a good volume to target in your niche. I would choose words with at least 1000 global monthly searches when writing content to attract search traffic. 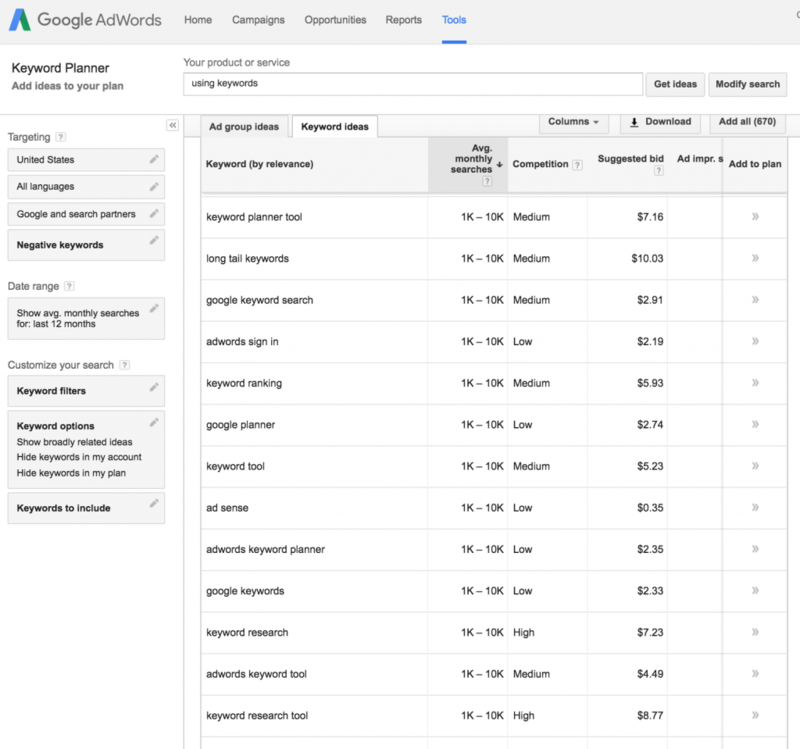 You will notice that unless you actually pay for ads, the Keyword Planning Tool (as of October 2016) groups monthly search volume into large ranges: 10K – 100K, 1K-10K, 100-1K. These are very broad groupings indeed. How can you make a good choice between two words in the same big group? For example, say we want to choose between “keyword research” and “google keywords.” But both the 1K-10K search per month group. There’s a lot of difference between a search term that gets 1000 searches per month, and 10,000 monthly searches. This is where the Keyword Trends tool comes in handy. Here we compare two search terms we just found — “keyword research” and “Google keywords” — in the tool. Because search traffic always grows over time, the data is “normalized” against a score of 100. That means that actual searches are scored against the maximum volume of searches a term could get at that time, which is scored at 100. 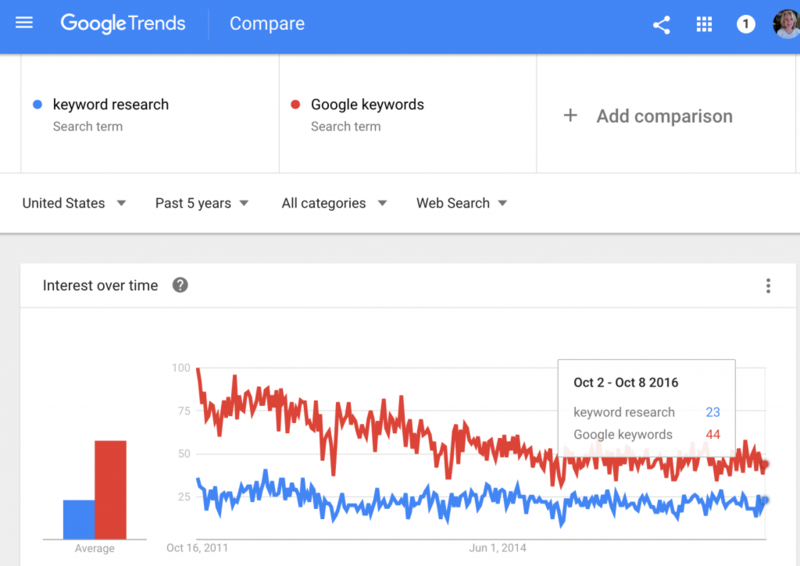 You can see that in 2016, “Google keywords” outscores “keyword research” by around twice the monthly search volume. We can search one keyword at a time. 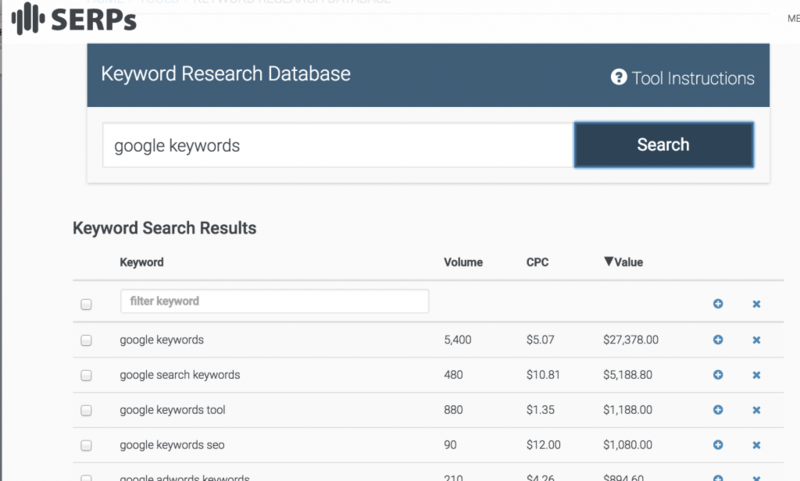 The SERPs Keyword Research Database gives a monthly search volume rounded to the tens place. It also shows you other search terms that are related to your keyword. In the free tool we have to search our terms separately. Now you can see “Google keywords” gets about 5,400 monthly searches according to the SERPs tool and “keyword research” gets about 4,400. Say you want to get traffic to your website for 10 different keywords. Just sprinkling them in among your pages is not a good investment of you or your team’s time. To get traffic for 10 different keywords, I suggest choosing 10 targeted keywords. Then create 10 concise pieces of content optimized for one keyword at a time. Remember, your search results bring visitors – not just to your website – but to a specific page. And, getting them to a page of really useful information is great. Now you need a plan for what’s next! You will need to guide them to the next step in getting to know you and trust you once they are on your page. Getting keyword traffic is part of a larger strategy. Keywords are tools to get more traffic to your website for a reason. They are part of a strategic system for your goals, whether it’s growing your following, subscribers, or gaining customers. Having a good strategy for your keyword traffic saves you from doing less-useful work, such as stuffing keywords into your site. It helps you stay focused on doing what helps you more – such as growing your mailing list, asking for more social shares, or learning from your visitors from comments, phone calls or feedback. Keywords draw visitors to what they want — helpful information. A good keyword strategy includes creating useful content for each specific term, and leading the visitor to a next step to becoming your customer. You’re looking smarter — share your reading with a click! Thanks, Joanne! Great checklist with important details. What do you think about such alternative to Google Keyword Planner as http://kparser.com?